Image Source: @GeorgMir, the creator, on Twitter. I have been playing Dungeons and Dragons since I was a wee, scared and closeted gay lad of 8, and it played an exceptional role in allowing me to discover places to hide away with fantasy and escape. Over the years I got into a few other games, such as Shadowrun —or any of many games involved in the White Wolf franchise— but, I did not really understand the scope of diversity in independent ideas until I joined the conversation about tabletop role playing games on Twitter. Now I am 32, and having learned so much about myself and my gender, it is amazing to see games being made of all kinds, completely outside of the scope of your average “sword and sorcery man hero” games that I used to play as a kid. Many indie developers of queer and feminist identities are making some of the most innovative, intersectional, and amazing homebrew content, as well as entire game systems in their own right. One of these creators who I am lucky enough to see a bit of myself in the work of (and thus, be incredibly inspired by it) is a game developer living in Austria named Georg Mir. 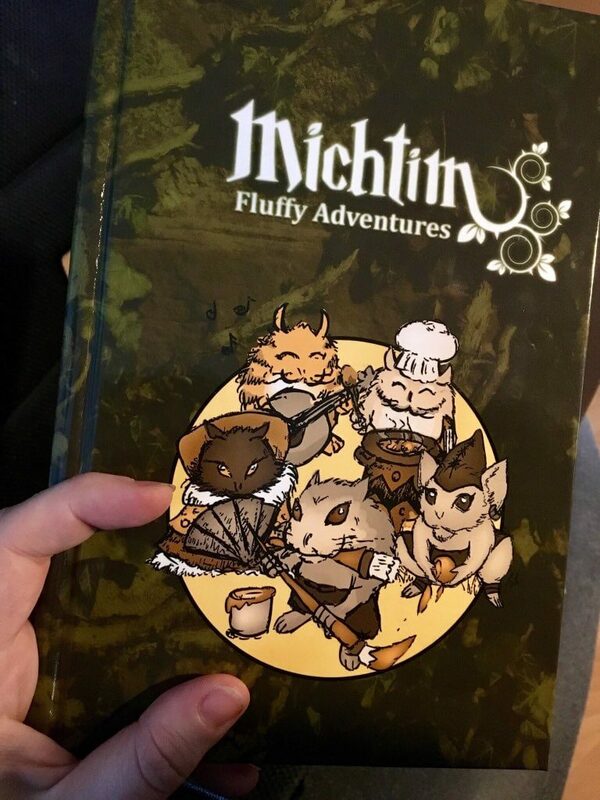 Georg is the creator of Michtim: Fluffy Adventures, self described as an “inclusive roleplaying game for kids and grown-ups”. Michtim is an incredible game starring small, cute hamster-like creatures (inspired by 90’s cartoon characters like Smurfs, and Ewoks!) which goes above and beyond by providing content which gives an ethical perspective on gaming, culture, fairness, and social justice. The system is extremely accessible, easy to learn and has a opportunity for all kinds of play. Georg actually has an excellent way of describing their views and how it affects Michtim’s production, so I thought I would just hand over the mic to see what happens. I had the chance to ask them a few questions so that they could let us know what Michtim is all about! B3: I really enjoy your take on turning the “classic ability score” (strength, dexterity, intelligence) into emotions! This gives so many new avenues of play. I was inspired by a tweet of yours to think about how that makes ranges such as joy or depression affect gameplay. It reminded me a lot of a video game called “Depression Quest”, but with many more options. Would you like to speak to that? GM: So, for my bachelor thesis I studied some neuroscience to learn about basic rules and realities in information processing. I turn everything into games. My understanding of emotions, mental patterns, activated neuronal patterns all translated into game mechanics. I figured that I wanted a very different approach, agnostic to the “how” and more into the why. How you deal damage is defined by Callings and Equipment mostly. Your capacity for dealing damage as a mage is the same as a warrior’s: it’s your anger. Anger, as all Emotions, fulfills an important job in our survival. All I did was use these patterns in my game design. B3: The setting just seems to grow and grow on a daily basis (I really enjoy following your Twitter), but one of the biggest parts that stood out to me was this idea of Humans coming in and building a big mall or infrastructure in the Michtim’s forest home. This is a wonderful way of turning the “DND premise” of humans fighting monsters on its head. What was your inspiration for this? GM: Basically my life was always about empathy and kinship with others; when I see what people do to our world out of greed it makes me want to cry. Classic dungeon crawls might actually be a rethemed colonialist mindset. You feel entitled to root out these creatures out of their dungeons, because you call them evil. That’s a problem. It’s been done countless times to indigenous, non-white people. I think that there are enough avenues for adventure that aren’t oppressive. We can take a very real problem, the destruction of our environment, and use it as foundation for epic adventures and missions into hostile territory, while upholding ethics and teaching players about real problems. B3: So you have already been nominated for a World Experience Aware, published a Hardcover Physical Copy, have had people do liveplays and fanart of Michtim, amassed a pretty large following on twitter, and I see praise for your illustrations quite often! This is a great foundation, what do you see in the future for Michtim? Thanks for letting us into your creative space, Georg! Michtim has so many brilliant possibilities of play. Defending your home against a mayhaps “more technologically advanced” society? If emotions are the ability scores that affect play, just imagine how things like joy and sadness bring about results and RP in character? To find out more about Michtim: Fluffy Adventures, follow this link to the website or follow Georg on Twitter! The game is available at “pay what you can” prices, because Georg believes in making their work available to everyone and anyone. However, (and this is the reviewers note here!) designers and developers deserve to get paid for their work! So please if you can afford it, buy it all full price or more at its DriveThruRPG page so that we can continue to get more wonderful work like this. The world needs it!